When it comes to designing the perfect children’s bedroom, imagination can run wild. From bright and happy colors, to adventurous and adorable décor, creating a children’s bedroom can be a lot of fun. 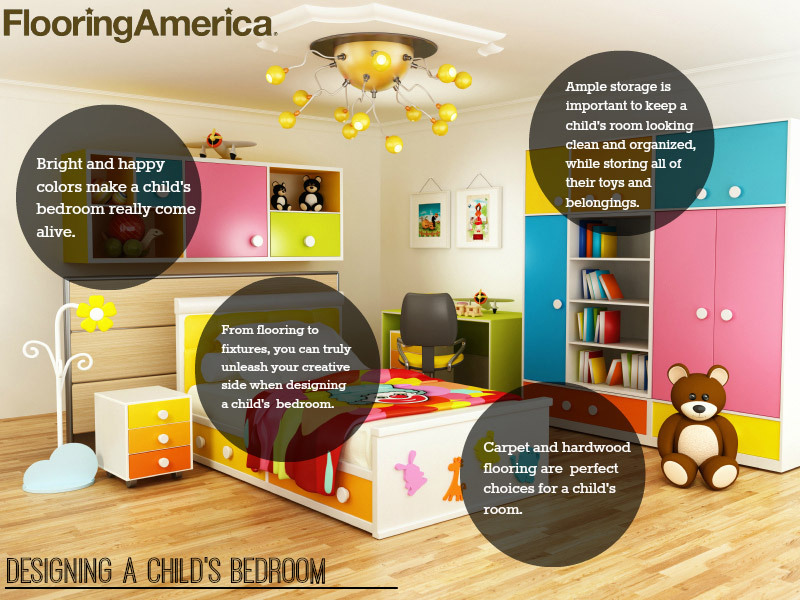 However, there are a few factors to take into consideration before designing your child’s new bedroom. From flooring to fixtures, these are our favorite tips to create your child’s own little paradise. A great starting point for creating the perfect child’s bedroom is to discover and assess your child’s hobbies and interests. Speak to your child and ask them if they have a particular theme in mind for their bedroom. It is also important to note that children often go through phases, and lose interest in the things they enjoy in the present. Many parents often opt to design a bedroom that doesn’t encompass one particular theme. Of course, you can add non-permanent elements to their bedroom that represent their current interests, by using television/film character bedding, or even framed art. Many companies offer duvet covers and children’s bedding that feature designs based on popular culture items and hobbies. When it comes to choosing the perfect flooring for a child’s bedroom, there’s no better choice than carpet. Carpet provides an ample amount of warmth and comfort, but also adds padding and protection for even the most active children. Because the bedroom often gets less heavy foot traffic than other rooms, a carpet can truly last for years before needing replacing. Of course, you can install other popular flooring options like hardwood flooring, laminate flooring or even tile flooring. Carpet also offers noise reduction, which can ensure your child isn’t distracted by the sounds coming from downstairs while you try and get your little one to sleep for the night. Carpet also comes in a large variety of colors that will fit into any theme or overall color palette. Ample storage is important in a children’s bedroom to properly store toys, books and games. Having a large toy box in a child’s room is highly recommended. A toy box helps avoid clutter and keeps the room clean and organized. Lamps, pillows, and bedding are also important components of a children’s bedroom, and with a large selection of children oriented décor options available, creating your children’s dream bedroom is a breeze. When it comes to designing the perfect bedroom for your child, consider finding the best selection of carpet and other flooring options at Flooring Canada. With over 500 stores nationwide, finding the perfect carpet or other flooring option for your child’s bedroom has never been easier.